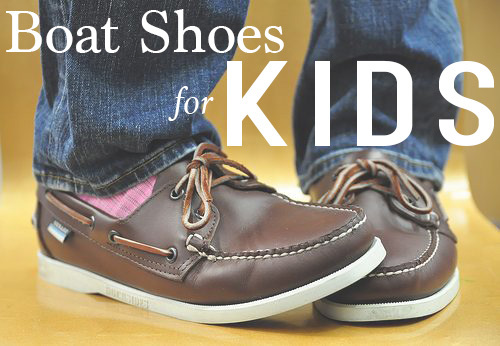 Let’s talk about kids boat shoes. Sometimes we focus so much on the adult aspects of sailing, we forget that kids and sailing go hand in hand. Children are learning how to sail anywhere from ages 2 to 17. Check out our earlier posts Kids and Sailing and our 16 year old friend John and his Hobie Way of Life. Before your favorite young ones take to the water, they’ll need shoes to keep their toes on the boat. Here’s our list for the Best Kids Boat Shoes 2016. As always, all of these kids boat shoes you can find on Amazon. These shoes are the quintessential look for any preppy girl or boy. Gender neutral means they can be great hand-me-downs from sibling to sibling. They can give a dress up or dress down look. One thing to note, these are real shoe laces that actually tie. So if you’re buying these for a toddler, keep that in mind. As a 5 year old reviewer said, “these shoes make me faster!” Who can argue that? While they may make you faster, they’ll also allow your kids shoes to get wet without worry and dry quickly. We like the vents in these shoes that allow water to drain through the sole. Parent approved and Kid approved too. In fact, if you want to get a matching set for yourself mom’s, check these Women’s Boat Shoes. These shoes are meant to go anywhere and do anything. Go for a walk, a run, to the park, to the beach anywhere you can imagine. We like them for sailing since they are waterproof, have a good grippy sole and won’t fall off those little feet. They come in a variety of sizes and colors so toddlers-12 year olds can enjoy wearing these. If you’re ready to have your kids look, act and feel the part of the true adventurer, then this is the shoe for you. These shoes were born to worn outdoors and having fun. They come in 20 different colors for both boys and girls. At first glance these shoes appear to be lacking in the grippy sole department, (an important factor for us sailors) but reviewers insist that these shoes do not slip on wet surfaces. Check them out. These kids’ boat shoes may not be classified as “shoes” at all, they are really more like sandals. The classic name brand of Osh Kosh B’ Gosh, has come out with another awesome article of clothing for children. They range in sizes to fit a 1 year old all the way up to an 8 year old. There are a variety of colors and patterns to choose from and it has an almost 100% parent approval rating. They will protect their little feet while allowing them to run, jump and play in the water and dry out quickly. Pick up a pair here on Amazon. Let us know what your favorite Kids Water Shoes are in the comments below.